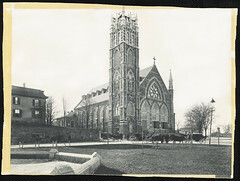 Boston Public Library has some amazing historical images of Dorchester, we'll be posting random images. This one shows the 1st house renovated on TV by This Old House on the left (Percival St), with the original tower of St. Peter's Church, Meetinghouse Hill. We'd like to encourage awareness of the value of old structures - preservation = recycling.